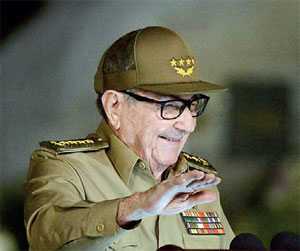 HAVANA (Reuters): On the 60th anniversary of Cuba’s revolution, ruling Communist Party leader Raul Castro blasted the Trump administration for returning to an outdated path of confrontation with the island nation and of intervening in Latin America. Castro and his late, elder brother Fidel Castro led the rebel band that in 1959 overthrew a US-backed dictator and installed a Communist-run country on the doorstep of the United States, setting the scene for decades of Cold War hostility. At the time, their revolution inspired leftist movements throughout Latin America, but the celebrations on Tuesday came as the region is shifting rightwards, coinciding with the inauguration of Brazil’s far-right President Jair Bolsonaro.Some of Cuba’s closest allies, Venezuela and Nicaragua, are mired in political crises, and US President Donald Trump has tightened the decades-old US embargo on the island, after his predecessor, Barack Obama, had sought to normalise relations. “Once again, the North American Government is taking on the path of confrontation with Cuba,” Castro said in the southeastern city of Santiago de Cuba where Fidel Castro proclaimed victory six decades ago. The speech by Castro, who stepped down as president in April but remains head of the Communist Party until 2021, was part of a solemn, sunset ceremony in a cemetery where both Fidel Castro and independence hero Jose Marti are buried.